Date palm or date is the common name for a palm tree, Phoenix dactylifera, characterized by pinnate, "feather-like" gray-green leaves and an edible fruit in the form of a drupe with a thin, papery skin, and a single, long, narrow, hard seed. The term date also is used for just the palm tree's fruit, which is borne in clusters and is one of the oldest cultivated tree crops, with a history of over 5,000 years. While the term "date palm" by itself typically is associated with P. dactylifera, other species in the Phoenix genus also utilize the term. For example, P. canariensis is known as the Canary Island Date Palm and is widely grown as an ornamental plant. It differs from the former in having a stouter trunk, more leaves to the crown, more closely spaced leaflets, and deep green rather than gray-green leaves. The fruit of P. canariensis is edible, but rarely eaten by humans because of its small size and thin flesh. This article is on P. dactylifera. The nutritious and flavorful date is a traditional staple food of the Middle East and also the source of syrup, alcohol, and vinegar. Other date palm components—seeds, wood, and leaves—are used for a wide diversity of applications. These include: Ground-up seeds—animal feed and a coffee additive; oil—soap and cosmetics; wood—posts and rafters; leaves, including the petioles—mats, screens, fans, rope, and fuel, and, in Christianity, for celebrating Palm Sunday. The date palm is a member of the palm family, Arecaceae (sometimes known by the alternative name Palmae). Arecaceae is a family of monocotyledon flowering plants. There are over 200 genera in the palm family with around 2,600 species, most of which are native to tropical or subtropical climates. Members of Arecaceae have large evergreen leaves that are either palmately ("fan-leaved") or pinnately ("feather-leaved") compound and spirally arranged at the top of the stem. The leaves have a tubular sheath at the base that usually splits open on one side at maturity. The flowers are generally small and white and radially symmetric. The sepals and petals usually number three each and may be distinct or joined at the base. The stamens generally number six, with filaments that may be separate, attached to each other, or attached to the pistil at the base. The fruit is usually a single-seeded berry or drupe (fruit in which an outer fleshy part surrounds a pit or stone with a seed inside). The Phoenix genus includes 13 known extant species. The genus is unique among members of the subfamily Coryphoideae, being the only one with pinnate, rather than palmate leaves (Riffle and Draft 2003). The name derives from a New Latin form of φοῖνιξ, the Greek word for "date palm," probably referring to the Phoenicians who brought the palm with them in their travels or maybe from φοινός, "red-colored," referring to the color of dates. Phoenix foliage showing V-shaped leaflets. This genus is mostly medium to robust in size but also includes a few dwarf species. The pinnate leaves, 1-6 meters long, all share the common feature of metamorphosed lower-leaf segments into long, vicious spines (acanthophylls). The leaves have short or absent petioles and possess the rare feature among pinnate palms of induplicate (V-shaped) leaflets. The plants are dioecious, with male and female flowers on separate plants; pollination is by both wind and insect. The flowers are inconspicuous yellowish-brown and about 1 centimeter wide, but grouped on conspicuous large multi-branched panicles 30-90 cm long. The inflorescence emerges from a usually boat-shaped, leathery bract, forming large, pendent clusters. Phoenix fruit develops from one carpel as a drupe, 1-7 centimeters long, yellow to red-brown or dark purple when mature, with one elongate, deeply-grooved seed. In addition, some authorities include Phoenix atlantica, or Cape Verde palm, endemic to the Cape Verde Islands, although others characterize it as a feral P. dactylifera. Phoenix dactylifera is a medium-sized tree, 15 to 25 meters (49 to 82 feet) tall, often clumped with several trunks from a single root system, but often growing singly as well. The pinnate leaves are 3 to 5 meters (10 to 16 feet) long, with spines on the petiole and about 150 leaflets. The leaflets are 30 centimeters (12 inches) long and 2 centimeters (.8 inches) broad. The full span of the crown ranges from 6–10 meters (20-33 feet). The fruit of P. dactylifera is a drupe known as a date. Dates are large with a thick layer of fruit pulp, edible, very sweet, and rich in sugar; the other species in Phoenix have only a thin layer of fruit pulp. P. dactylifera fruits are oval or cylindrical, 3–7 centimeters long and 2–3 centimeters in diameter. Each date contains a single seed about 2 to 2.5 centimeters long and 6–8 millimeters thick. The skin is thin and papery. When unripe, they are green, and change to yellow, golden brown, mahogany red, or black as they ripen, depending on variety (Herbst 2001). As characteristic of the Phoenix genus, the plants are dioecious, with male and female flowers on separate plants. humans have cultivated the date palm for its edible fruit for so many centuries that the tree's native distribution is unknown. However, it probably originated somewhere in the desert oases of northern Africa, and perhaps also southwest Asia. Dates (Arabic: تمر Tamr) have been a staple food of the Middle East for thousands of years. They are believed to have originated around the Persian Gulf, and have been cultivated since ancient times from Mesopotamia to prehistoric Egypt, possibly as early as 4000 B.C.E. (Zaid and de Wet 2002). Date wood, pits for storing dates, and other remains of the date palm have been found in Mesopotamian sites (Miller 2000). One could go as far as to say that, had the date palm not existed, the expansion of the human race into the hot and barren parts of the "old" world would have been much more restricted. The date palm not only provided a concentrated energy food, which could be easily stored and carried along on long journeys across the deserts, it also created a more amenable habitat for the people to live in by providing shade and protection from the desert winds. In addition, the date palm also yielded a variety of products for use in agricultural production and for domestic utensils, and practically all parts of the palm had a useful purpose. In later times, Arabs spread dates around South and South East Asia, northern Africa, and Spain. Dates were introduced into Mexico and California by the Spaniards by 1765, around Mission San Ignacio. As a dioecious species, having separate male and female plants, date palms can be easily grown from seed. However, only 50 percent of seedlings will be female and hence fruit bearing, and dates from seedling plants are often smaller and of poorer quality. Most commercial plantations thus use cuttings of heavily cropping cultivars—mainly "Medjool," as this cultivar produces particularly high yields of large, sweet fruit. Plants grown from cuttings will fruit two to three years earlier than seedling plants. Dates are naturally wind pollinated but in both traditional oasis horticulture and in the modern commercial orchards they are entirely pollinated manually. Natural pollination occurs with about an equal number of male and female plants. However, with manual pollination, one male can pollenize up to 100 females. Since the males are of value only as pollenizers, this allows the growers to use their resources for many more fruit producing female plants. Some growers do not even maintain any male plants as male flowers become available at local markets at pollination time. Manual pollination is done by skilled laborers on ladders, or in some areas, such as Iraq, they climb the tree using a special climbing tool that wraps around the tree trunk and the climber's back to keep him attached to the trunk while climbing. Less often the pollen may be blown onto the female flowers by wind machine. Parthenocarpic cultivars are available but the seedless fruit is smaller and of lower quality. Date palms take about seven years after planting before they will bear fruit, and they produce viable yields for commercial harvest after about 10 years. 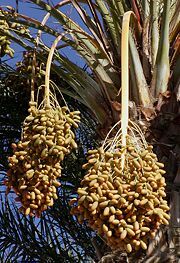 Mature date palms can produce 80–120 kilograms (176-264 pounds) of dates per harvest season, although they do not all ripen at the same time so several harvests are required. In order to get fruit of marketable quality, the bunches of dates must be thinned before ripening so that the remaining fruits grow larger. Dates usually are harvested when green and ripened off the tree before drying (Herbst 2001). Dates require a hot and dry climate, and flourish in the Middle East, Africa, and California and Arizona in the United States. Iraq used to be a major producer of dates but in recent years the amount of dates produced and exported has decreased. Date palm orchard, Boumalne, Morocco. 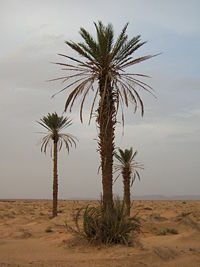 Three main cultivar groups of date exist; soft (for example, Barhee, Halawy, Khadrawy, Medjool), semi-dry (for example, Dayri, Deglet Noor, Zahidi), and dry (for example, Thoory). The type of fruit depends on the glucose, fructose, and sucrose content. In soft dates, about 80 percent of the dry matter is invert sugars (mixture of equal parts of glucose and fructose), while in semi-dry dates, about 40 percent of the dry matter is invert sugars and forty percent is sucrose (Bender and Bender 2005). In dry dates, about 20 to 40 percent of the dry matter is invert sugars, and 40 to 60 is sucrose (Bender and Bender 2005). Ajwah—from the town of Ajwah in Saudi Arabia; it is the subject of a famous hadith of the prophet Muhammad. Amir Hajj or Amer Hajj—from Iraq, these are soft with a thin skin and thick flesh; sometimes called "the visitor's date" because it is a delicacy served to guests. Barhee (barhi) (from Arabic barh, a hot wind)—these are nearly cylindrical, light amber to dark brown when ripe; soft, with thick flesh and rich flavor. One of the few varieties which are good in the khalal stage when they are yellow (like a fresh grape as opposed to dry, like a raisin). Deglet Noor (Arabic: "Translucent" or "date of light"); so named because the center appears light or golden when held up to the sun. This is a leading date in Algeria, the USA, and Tunisia, and in the latter country it is grown in inland oases and is the chief export cultivar. It is semi-dry and not very sweet. Derrie or Dayri (the "Monastery" date)—from southern Iraq; these are long, slender, nearly black, and soft. Empress—developed by the Deval Family in Indio California USA from a seedling of Deglet Noor. It is larger than Deglet Noor, somewhat softer and sweeter. It generally has a light tan top half and brown bottom half. Ftimi or Alligue—these are grown in inland oases of Tunisia. Halawy (Halawi) (Arabic: "Sweet")—these are soft, and extremely sweet, small to medium in size. Hayany—from Egypt (Hayani) (Hayany is a man's name)—these dates are dark-red to nearly black and soft. Khadrawy (Arabic: Green)—a cultivar favored by many Arabs, it is a soft, very dark date. Khalasah (Arabic: Quintessence)—one of the most famous palm cultivars in Saudi Arabia; famous for its sweetness level that is not high nor low, thus, suits most people. Its fruit is called Khlas. Its famous place is Huffuf (Al-Ahsa) in the Eastern Province of Saudi Arabia (Al-Sharqheyah). Khastawi (Khusatawi, Kustawy)—this is the leading soft date in Iraq; it is syrupy and small in size, prized for dessert. Maktoom (Arabic: 'hidden')—this is a large, red-brown, thick-skinned, soft, medium-sweet date. Manakbir—a large fruit which ripens early. Medjool (Arabic: Unknown)—from Morocco, also grown in the USA, Jordan and Israel; a large, sweet and succulent date. Migraf (Mejraf)—very popular in Southern Yemen, these are large, golden-amber dates. Saidy (Saidi)—soft, very sweet, these are popular in Libya. Sayer (Sayir) (Arabic: Common)—these dates are dark orange-brown, of medium size, soft and syrupy. Sekkeri—(lit. sugary) Dark brown skin; distinctly sweet and soft flesh, from Saudi Arabia. Thoory (Thuri)—popular in Algeria, this dry date is brown-red when cured with a bluish bloom and very wrinkled skin. Its flesh is sometimes hard and brittle but the flavor described as sweet and nutty. Umelkhashab—from Saudi Arabia; brilliant red skin; bittersweet, hard white flesh. Zahidi (Arabic: [Of the] ascetic)—these medium size, cylindrical, light golden-brown semi-dry dates are very sugary, and sold as soft, medium-hard and hard. There are more than 100 known cultivars in Iraq. It should be noted, however, that a cultivar may have several names depending on the locality. Date Palms are susceptible to a disease called Bayoud disease, which is caused by the fungus Fusarium oxysporum. This disease, which kills many of the popular older cultivars like "Deglet Noor," has led to a major decline in production where it is present, notably Morocco and western Algeria. However, new cultivars resistant to the disease are being developed. Dates are eaten fresh or dried, with dried dates available year-round and sold pitted or unpitted (Herbst 2001). Fresh dates may be stored up to two weeks in a refrigerator, wrapped in a plastic bag, while dried dates can be stored, in an airtight container, for up to 6 months at room temperature or up to a year in a refrigerator (Herbst 2001). A 100-gram portion of fresh dates is a premium source of vitamin C and supplies 230 kcal (960 kJ) of energy. They are a good source of protein and iron (Herbst 2001). Sugar becomes more concentrated as the date dries, but in overall nutrients, since dates contain relatively little water, they do not become much more concentrated upon drying, although the vitamin C is lost in the process. Dates ripen in four stages, which are known throughout the world by their Arabic names kimri (unripe), khalal (full-size, crunchy), rutab (ripe, soft), and tamr (ripe, sun-dried). Dates are an important traditional crop in Iraq, Arabia, and north Africa west to Morocco and are mentioned in many places in the Quran. In Islamic countries, dates and yogurt or sometimes milk are a traditional first meal when the sun sets during Ramadan. Dates (especially Medjool and Deglet Noor) are also cultivated in southern California in the United States. Date seller in the old souq in Kuwait City. Dry or soft dates are eaten out-of-hand, or may be pitted and stuffed with fillings such as almonds, walnuts, candied orange and lemon peel, marzipan, or cream cheese. Pitted dates are also referred to as "stoned dates." Dates can also be chopped and used in a range of sweet and savory dishes, from tajines (tagines) in Morocco to puddings, bread, cakes, and other dessert items. Dates are also processed into cubes, paste, spread, date syrup, or "honey" called "dibs," powder (date sugar), vinegar, or alcohol. Recent innovations include chocolate-covered dates and products such as sparkling date juice, used in some Islamic countries as a non-alcoholic version of champagne, for special occasions and religious times such as Ramadan. Dates can also be dehydrated, ground, and mixed with grain to form a nutritious stockfeed. Dried dates are fed to camels, horses, and dogs in the Sahara. In northern Nigeria, dates and peppers added to the native beer are believed to make it less intoxicating. Young date leaves are cooked and eaten as a vegetable, as is the terminal bud or heart, though its removal kills the palm. The finely ground seeds are mixed with flour to make bread in times of scarcity. The flowers of the date palm are also edible. Traditionally, the female flowers are the most available for sale and weigh 300-400 grams (11-14 ounces). The flower buds are used in salad or ground with dried fish to make a condiment for bread. In India, North Africa, Ghana, and Côte d'Ivoire, date palms are tapped for the sweet sap which is converted into palm sugar (known as jaggery or gur), molasses, or alcoholic beverages. In North Africa, the sap obtained from tapping palm trees is known as lāgbī (pronounced [laːgbiː]). If left for a sufficient period of time (typically hours, depending on the temperature) lāgbī easily becomes an alcoholic drink. Special skill is required when tapping the palm tree so that it does not die. Dates also are used to make Jallab. Dates have a high tannin content and are used medicinally as a detersive (having cleansing power) and astringent in intestinal troubles. As an infusion, decoction, syrup, or paste, dates have been administered for sore throat, colds, bronchial catarrh, and taken to relieve fever and a number of other complaints. One traditional belief is that it can counteract alcohol intoxication. The seed powder also is used in some traditional medicines. A gum that exudes from the wounded trunk is employed in India for treating diarrhea and genito-urinary ailments. The roots are used against toothache. The pollen yields an estrogenic principle, estrone, and has a gonadotropic effect on young rats. Date palm stump showing the wood structure. Various parts of the date palm are used for a diversity of non-culinary, non-medicinal purposes. Seeds. Date seeds are soaked and ground up for animal feed, and their oil is suitable for use in soap and cosmetics. The seeds also can be processed chemically as a source of oxalic acid. The seeds are burned to make charcoal for silversmiths, and can be strung in necklaces. Furthermore, date seeds also are ground and used in the manner of coffee beans, or as an additive to coffee. Leaves. Date palm leaves are used in the celebration of Palm Sunday in Christian religion and in the Feast of the Tabernacles in Judaism. In North Africa, they are commonly used for making huts. Mature leaves also are made into mats, screens, baskets, and fans. Processed leaves can be used for insulating board. Dried leaf petioles are a source of cellulose pulp, used for walking sticks, brooms, fishing floats, and fuel. Leaf sheaths are prized for their scent, and fiber from them is also used for rope, coarse cloth, and large hats. The leaves are also used as a lulav in the Jewish holiday of Sukkot. Fruits. Stripped fruit clusters are used as brooms. In Pakistan, a viscous, thick syrup made from the ripe fruits is used as a coating for leather bags and pipes to prevent leaking. Wood. Date palm wood is used for posts and rafters for huts; it is lighter than coconut and not very durable. It is also used for construction such as bridges and aqueducts, and parts of dhows. Leftover wood is burnt for fuel. Where craft traditions still thrive, such as in Oman, the palm tree is perhaps the most versatile of all indigenous plants, with virtually every part of the tree utilized to make functional items, ranging from rope and baskets to beehives, fishing boats, and traditional dwellings. ↑ FAO, UN Food & Agriculture Organisation. Retrieved May 2, 2008. Alvarez-Mon, J. 2003. Imago Mundi: Cosmological and ideological aspects of the Arjan bowl. Iranica Antique 4. Retrieved April 25, 2008. Barreveld, W. H. 1993. Date Palm Products. FAO Agricultural Services Bulletin 101. Retrieved June 14, 2007. Miller, N. F. 2000. Plant forms in jewelry from the Royal Cemetery at Ur. Iraq 62: 149–155. Riffle, R. L., and P. Craft. 2003. An Encyclopedia of Cultivated Palms. Portland: Timber Press. ISBN 0881925586. Zaid, A., and P. f. de Wet. 2002. Chapter II: Origin, Geographical distribution and nutritional values of date palm. Food and Agricultural Organization. Retrieved April 25, 2008. This page was last modified on 11 September 2008, at 17:17.